Hey Gang! 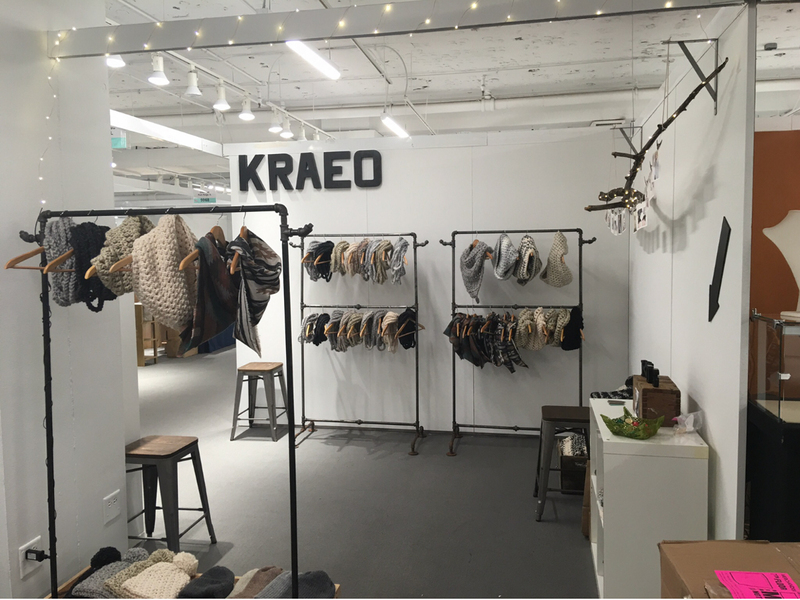 Kristin here from KraeO handmade! 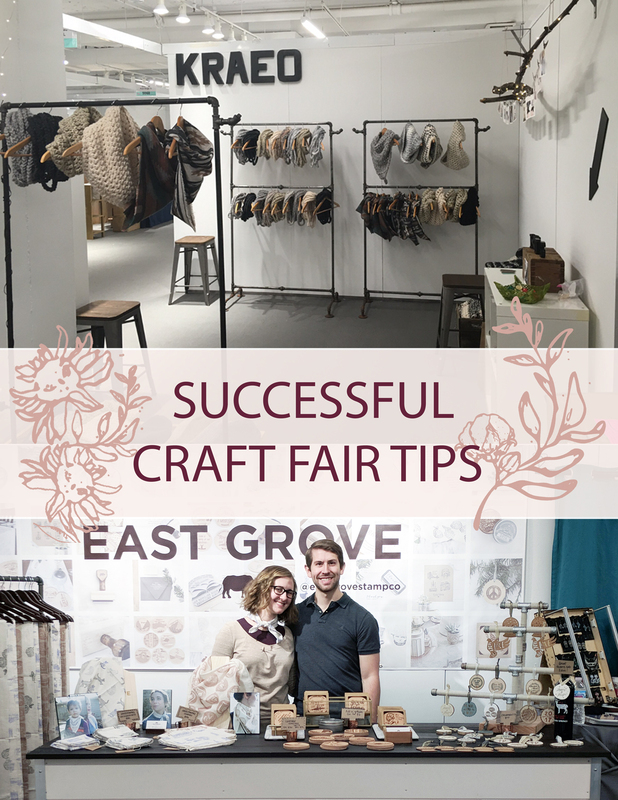 Today were going to talk about Craft Fair Market prep. 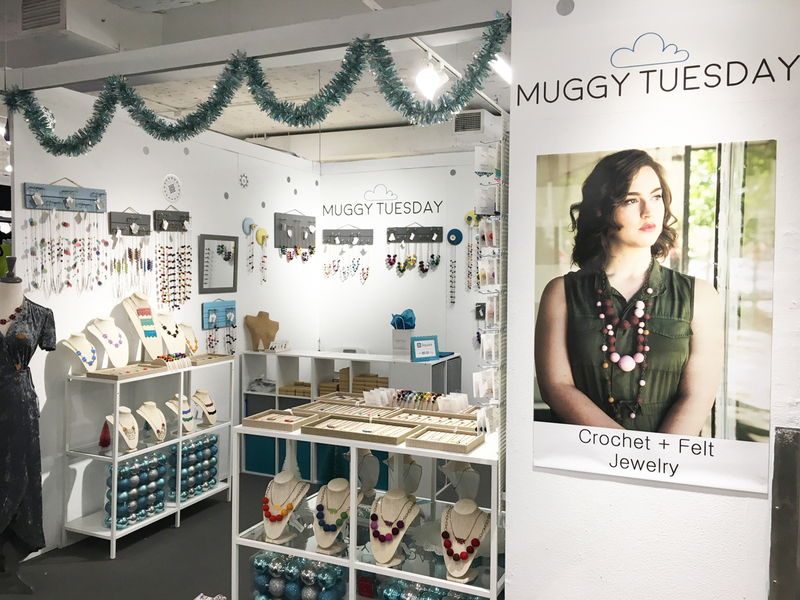 It’s that time of year again and whether this is your first time participating in a holiday market or you’re a seasoned veteran, I have some pointers for you. When I was first starting out I said yes to everything. Whether it was in a cafeteria or union hall or the Merchandise Mart in Chicago. I said YES. It was important for me to get my products in front of everyone. Now that I’ve been in business for a while I’ve learned which markets are the right fit for me and my business. Those first few years were hard. I had no idea how much product to bring, How much I should be paying to participate, and I certainly didn’t know how much money I should be making. I made a lot of mistakes and learned a lot about how to make a holiday market successful. I want to share that information with you so you can make the best decisions for your business and get the most out of this busy holiday season. You can find shows in your area through local community facebook groups. Ask around in the comments and you’ll get a plethora of options. Another great way to use facebook is by searching events in your area. Contact the person who made the event and ask how you can get involved. Local city websites and chamber of commerce sites are also a great way to find shows happening in your town or city. Another great resource is Etsy local. They have huge list of shows in your community. Eventbrite, fairsandfestivals.net, and festivalnet.com are great resources as well. I like to attend the show as a buyer before I commit to participating the following year. Most shows require a fee to participate. This can range from free to thousands! There are two different kinds of shows. Juried and non-juried. Juried shows require an application process to be accepted to participate. You’ll want to do some research to see what kind of crowd each show is attracting and check out the current list of vendors. How many of them will be selling similar things as you. How will you stand out? This is how you’re going to find the right fit for your business. The question I’m constantly asked is ‘how do you know how much product to bring ?’ There are several factors that go into this. For me the biggest one is deciding how much money you need to make for the show to be profitable. There’s a basic rule floating around that you should be making 7x your booth fee to have a successful show. That rule obviously doesn't apply to all businesses nor does it apply to every show. There are some important factors to consider when calculating out how much money you should be making. How much does it cost to make your items? Will you have travel expenses? Will you need promotional items such as postcards or new business cards? If you accept credit cards there is likely a small fee with each purchase. All of these things are expenses you will have to pay over and above your booth fee. So my advice would be to make an itemized list of expenses to help figure out how much this show is actually going to cost you. Calculate how much product you need to sell to be profitable, and that’s how you’ll decide the amount of product to make for the show. For example, If I know I need to make $1,400 to be profitable, I need to bring AT LEAST $1,400 in product to sell. Another factor is the length of the show. Is it 5 hours or 3 days? You want to make sure you have enough product to replenish items as they sell. You always want to make your booth looks full of the beautiful pieces you’ve made. What are your best sellers? Make sure you have plenty! In my opinion this is the most important part of your show. 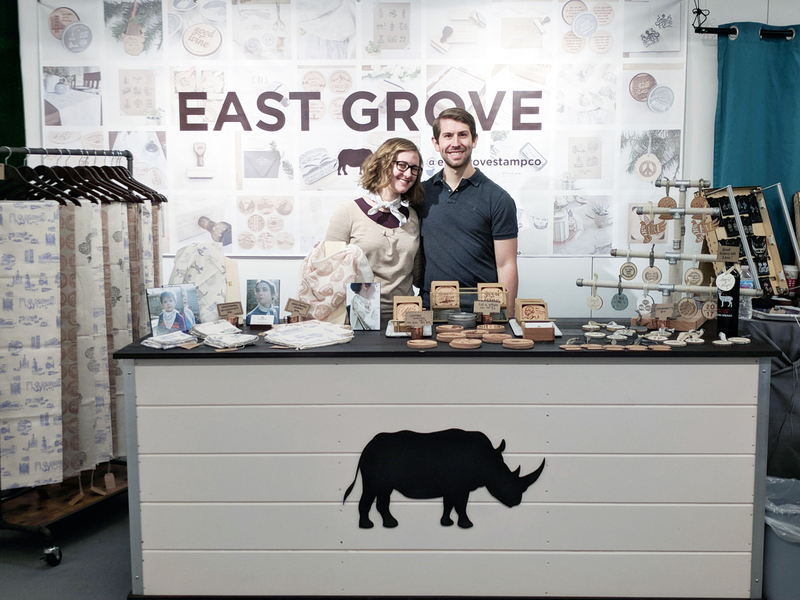 Your booth or table set up is the brick and mortar version of your online retail shop. You want it to look beautiful and inviting. This is the first impression you’ll be making to a potential buyer. You want buyers to walk by and feel like they HAVE to take a look! So what do you need for your booth set up? That depends on what you’re selling and how much space you’re given. I’ve always practiced my set up in my house in order to troubleshoot any potential issues so I can fix them before I get to the show. Some fairs will provide you with nothing but a table. If that’s the case, I’ve found it’s beneficial to build upwards. Bring some wooden crates or tabletop shelving that you can stack on top of one another to create more space for your products. This will create a more interesting visual experience. If you can get your products eye level, all the better. Make sure you have signage so people know who you are. If you can hang something behind your table, awesome! Not only will this save space, but people can see it from afar. When setting up your table or booth, think like a buyer. If you’re making wearables be sure to make it easy for customers to try them on. Don’t forget a mirror! I can’t tell you how many times I’ve forgot a mirror and have had to send people down the hall, or to the table next to me. SO EMBARRASSING!! And frustrating for the buyer. I can’t imagine how many sales I lost by making it more difficult for my customer to try something on. Now I bring two or three, just in case one breaks (has happened to me twice). I always keep a small mirror behind my table in case it gets too crowded, I can hold it up for a customer in need. I’m going to go out on a limb and say I think the most important part of your booth display for big shows is to make it easy on yourself. I’ve been doing the One Of a Kind Show here in Chicago for the past 6 years. It’s a huge 4 day show. I have a 10x10 booth with two days of set up time. A couple of years ago I realized I was spending WAY too much time setting up my booth. I was so exhausted after the initial set up, it made the next four days of showtime that much harder to get through. Not to mention taking it all down and packing up to leave. I have gotten my booth set up down to about 3 hours of work. I bring a couple of clothing racks, hangers, some shelving and a small table. OH! Don’t forget a couple of chairs. You’re going to need to sit. Also your customers will thank you when they come into your booth and realize they can take a load off for a few minutes. This is a great opportunity to shmooze. 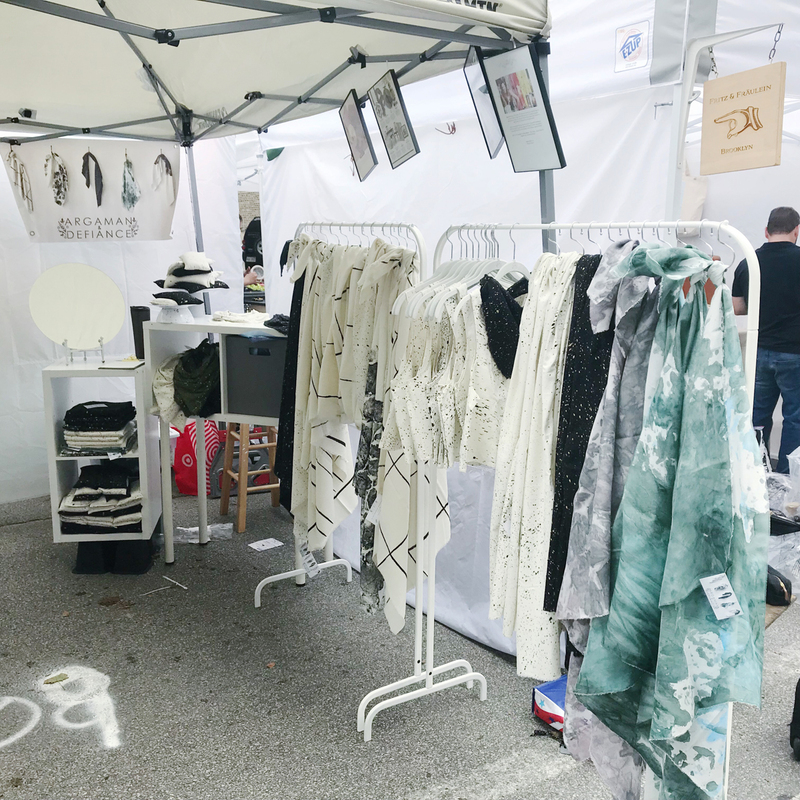 My knitwear line consists of mostly neutral colors, so I limit the color theme of my booth to black and white. I add a couple of little area rugs for a pop of color, and that’s it!. I’ve learned less is more. But that’s just me! The point is to stay on brand. Maybe your brand is all about color, texture and pattern. Don’t be afraid to show your personality. Do what feels right to you and what best represents your brand. Just remember you want your set up to enhance your products, not outshine them. Cash to make change for customers - For the customers that want to pay cash, you’ll need to be able to make change. This could potentially cost you a purchase if you can’t make change. They say they’ll come back later, but who knows! Business cards - Put these all over your booth or table. I get a ton of online sales after a show. You want your customers to be able to find you once they leave. Mirror- Don’t forget that dang mirror! Price tags - Remember to price all your items. As a rule I try to give my customers as much information as possible before potential questions arise. They don’t want to pick everything up and ask me how much it is. Clearly price each item. An emergency kit - This is very important. Pack yourself a bag that contains scissors, tape, pens, safety pins, extra business cards and price tags, an extra credit card reader, and a phone charger. I have never NOT needed these things in the middle of a show. Now that the show has started its time to make yourself available to customers. Make sure to greet everyone who comes by. I often continue knitting or crocheting while in my booth. People love to see you working on the products you’re selling. I get many people who pop in just to watch me knit. This is a great way break the ice and draw potential buyers into your booth. People attract people. The more traffic in your booth, the better. One more thing before I go...Don’t forget to eat and drink water! Doing these shows is a lot of work, physically and mentally. Keep yourself hydrated and your belly full so you can work at your full potential. Good luck and have a great Holiday season!